From reading part one of this post you would probably agree that there are many b enefits to baby wearing. However, you may have also heard recent reports questioning the safety of baby slings. You may be questioning whether or not to buy a sling; or if you already have a sling, you may be wondering how to wear your baby safely. What follows is a summary of the U.S. Consumer Product Safety Commission reports on sling use along with links to their full text so that you can make your own informed decision about using slings. We've also included some important safety tips for sling wearing moms and a great link to more safety information from Baby Wearing International. The U.S. Consumer Product Safety Commission (CPSC) released a report in March 2010 (Click here for full text) advising parents and caregivers to use caution while using baby slings with babies less than 4 months old. The CPSC identified, and is now investigating, at least 14 deaths over the last 20 years associated with sling-style carriers (12 of which were in babies less than 4 months old). The deaths resulted from suffocation; however, most of the babies who died were low birth weight, premature or had breathing issues (including colds). Thus, parents of babies in these high risk groups should use extra care when using slings. Two types of suffocation hazard can occur with slings: 1) The sling fabric can cover the baby’s nose and mouth, blocking their breathing (in young babies who still have weak neck muscles) and 2) when the sling puts the baby into a position where the baby’s chin is curled into his chest (can restrict the airway). Currently, the CPSC is working to add slings to the list of infant products that require a mandatory standard. A separate report was released by CPSC recalling the SlingRider brand baby sling. For more information about this recall click here. It is extremely important that your baby is positioned in the sling correctly. Follow any instructions given by the manufacturer and always position your baby so that she can breathe (make sure her chin is not curled against her chest and her face is not covered by fabric). There should be a fingers' width or two between the baby's chin and chest. Correct positioning is especially important for babies less than 4 months old because their neck muscles are still weak. I have to say I feel biased writing this post because I am such a big proponent of babywearing after my own sling-toting experiences with my daughter. However, there have been 2 recent reports published by the U.S. Consumer Product Safety Commission warning about sling use in young infants. At our office, and as we travel to spread the Baby Behavior messages around California and beyond, we are continually asked our opinion about the recent controversy over the safety of sling use. We hope to give you some research-based (and real life) perspectives on the good and the bad about baby slings. There was so much information out there that we decided to write this in 2 posts. Today, we'll look at the benefits of baby wearing, and next Tuesday we'll look at the recent reports questioning sling safety and share some tips to help you make an informed decision about baby wearing. I was given several slings while pregnant with my daughter, and I never could have imagined then how useful a sling would be after my bundle of joy arrived. The sling gave me the ability to do many activities “hands-free” while keeping my baby close. I have vacuumed, done laundry, prepared meals (but not cooking on a hot stove! ), hiked trails, grocery shopped, played Frisbee with my dog, and safely navigated a few airports, all with my baby girl safely tucked against my chest. With some practice I even learned to breastfeed my daughter in the sling. As you can imagine, slings are a great bonding tool for mothers and babies, but fathers and other caregivers can also wear the baby. I have some pretty funny memories of my Husband wearing our 9 month old daughter in my bright red Moby Wrap! Baby wearing by other caregivers not only provides mom with a break, it also allows those loved ones to connect and build a close relationship with the baby. The “skin-to-skin” contact also regulates the baby’s heart rate and temperature - not to mention the fact that babies are just a lot happier when they are close to their mom or other loved ones. Wearing my daughter in a sling also helped me connect with her during the very challenging 1st 6-weeks of her life when I was exhausted and depressed. But you don’t have to believe just my own experience! Let’s take a look at the research. A small study by Anisfeld, et al, showed that increased physical contact (mothers received soft baby carriers and were instructed to use them everyday) resulted in significantly more secure attachment between mothers and infants. Eighty-three percent of infants held in baby carriers were securely attached versus 38% in the control group (given infant seats) at 13 months of age. 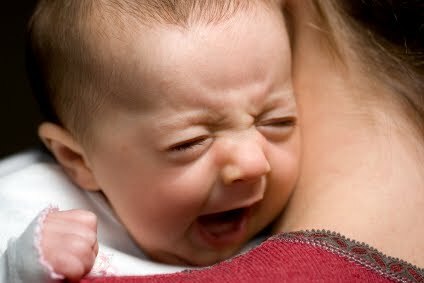 The presumed reason being that carrying the baby leads the parent to provide faster responses to the infant's crying and cues, resulting in the infant feeling more secure. Further analysis even showed that sling-wearing positively affected infant-mother attachment beyond that which was attributed to increased responsiveness of the mother when wearing the baby close. You might wonder how they objectively measured how much time moms wore their infants in the carriers. Well, they actually sewed pedometers inside the slings! A randomized controlled trial of full term breastfed infants by Hunziker, et al. found that carrying your baby in arms or in a baby carrier (that provided body contact between mother and infant) for at least 3 hours per day (in addition to carrying regularly provided during feeding and in response to crying) reduced daytime crying by 43% and nighttime crying (4pm-12am) by 54%! Also, the normal peak in crying that occurs at 6-weeks of age was practically eliminated. From my own experiences and from research findings, it seems obvious that babywearing has many benefits, but is it really safe? When baby slings are worn properly, they can be safe, but it’s very important to follow a few important safety guidelines. 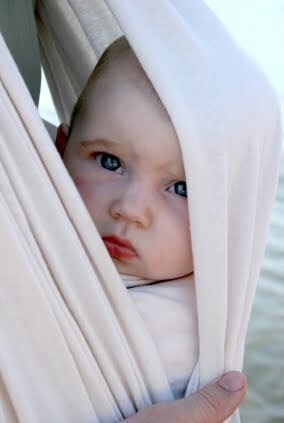 As with any baby product, you must learn to use slings properly and always keep safety in mind. In our next post, we’ll give you a brief overview of the recent safety warnings from the U.S. Consumer Product Safety Commission and share some guidelines for wearing slings safely. Stay tuned! 1. Anisfeld E, Casper V, Nozyce M, Cunningham N. (1990) Does Infant Carrying Promote Attachment? An Experimental Study of the Effects of Increased Physical Contact on the Development of Attachment. Child Development 61:1617-1627. Since so many of you have babies who are older than 6 months, our May quiz included questions about older babies. Here are the answers. 1. On average, at what age do babies double their birth length? Between 3 and 4 years of age. They triple their birth weight around 1 year of age (unless they were very large at birth). 2. When babies are very young, they see themselves in the mirror and think it is another baby. Typically, how old are babies when they realize they are looking at their own reflection? Around 1 year of age. Sometimes babies will be a little younger when they realize that they are looking at themselves in a mirror. 3. What percentage of babies get attached to a "security object" or "lovey" such as a soft toy or a blanket? About 60% of children get attached to a security object at some point. Usually attachment to objects (other than pacifiers) becomes noticeable around 12 months of age and is strongest between the ages of 2 and 3 years. By the time children are 5 1/2 years old, less than 10% still have a "lovey." 4. Can 12 month-old babies understand you when you ask them to do things, such as drink their milk or get their shoes? Yes! They can understand simple instructions if they are listening. Listening can be a big challenge for babies who are so easily distracted by everything around them. Getting down to eye level with your baby might help him focus on your face and words. 5. How old are babies when they can tell that their parents are happy or unhappy? Researchers tell us that babies can understand that their parents are happy or unhappy between 9 and 10 months of age. We're back with a new quiz to test your baby knowledge. Since so many of you have babies who are older than 6 months, we decided to ask some questions about older babies. As we get closer to our first anniversary, we've been making plans for some new series we'd like to share with our loyal readers. In our recent poll, we were reminded that most of our readers are parents of babies less than 2 years old. We also learned that many of you are parents of babies older than 6 months. We hope to add more content that will directly address your questions and concerns. For those of you with younger babies (and those of you still waiting for your babies), don't worry, we'll continue to share the latest research and answer your questions. Also, you can go back and review "the basics" by returning to our past posts. We recommend that newcomers read the first few posts from June of 2009 and then pick topics that interest you from the list on the left. 2. The Emotional Baby: How and When do Babies Develop Emotionally? and more..... Don't see your topics? Let us know what you want to read about. We've had several readers ask us questions about drowsy babies. Specifically, they want to know why their drowsy babies become fussy and irritable while others become quiet, relaxed, and easily drift to sleep. We'd like to use this post to focus on this challenging infant state. Babies move in and out of 6 different "states" or moods: crying, irritable, quiet alert, drowsy, active sleep, and quiet sleep. You can tell what "state" a baby is in by the way she moves, breathes, and the noises she makes. I'm sure you all know that babies become drowsy when they are tired. Tiny babies tire very quickly, especially when they've had to deal with a lot of stimulation. Drowsy babies will stop paying attention to things around them, open and close their eyes, yawn, breathe faster then slower, and rub their faces with their hands. Some babies, especially younger babies, also get cranky, fussy, and increasingly frustrated. Babies are hardwired to learn and socialize with the adults who care for them. They stare at their parents' faces, watch their mouths, try to copy their movements, and often calm down when they hear mommy's or daddy's voice. As babies get older, they become fascinated by every new object they see and try to touch, taste, drop, and explore everything in their reach. Babies work hard as little scientists, experimenting day and night to determine cause and effect. They love to play repetitive games and will giggle with excitement when they "discover" how to make their daddies' tickle their tummies or to elicit their mommies' smiles. Anything that gets in the way of that work may irritate babies. 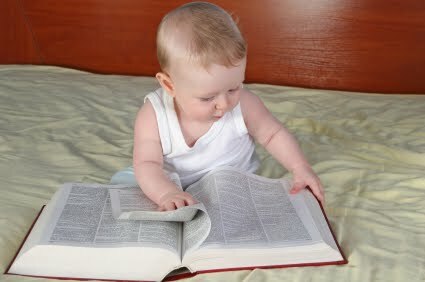 Unfortunately, babies can't maintain that learning state forever. They'll start to get sleepy, even though their brains and bodies will push them to learn more and more. For some very social and determined babies, sleepiness is so annoying, they'll start to cry. Some babies have a much harder time than others in changing their states, particularly calming themselves and getting to sleep. Fortunately, as babies get older, they get better at these important skills. However, all babies (even babies who regularly fall asleep easily), may struggle with sleep when they have been overstimulated or exposed to a stimulant like caffeine. Babies who are overstimulated (by vigorous play near nap or bed time, big changes in routine, or spending time in a crowd) have a hard time dealing with all the excitement. Their bodies react by releasing chemicals that stimulate their brains. Some babies will process these chemicals quickly, but others will not. Adults may have the same experience after watching a scary movie or attending a large party. In those circumstances, we can't fall asleep either. Some babies (and I had one) want the social time to last forever and fuss and cry and fight sleep with all their might. 1. Prevent over stimulation or any prolonged stimulation, particularly at bed time and nap time. 2. Avoid exposing your baby to stimulants like caffeine. 3. To calm your drowsy baby, maintain social play but slow the pace, gradually narrowing the type and duration of stimulation your baby receives. Limit what your baby sees, hears, and touches. Try slowly narrowing your interaction to include only one sense. Let her look quietly at your face OR hear your voice as she nestles into your shoulder. 4. Start a bedtime routine with a slow steady reduction in stimulation. Many experts suggest 45 minutes may be needed for a baby who struggles with getting to sleep. Don't worry, this won't last forever! 5. Try sustained stimulation, like white noise and steady motion, to help soothe babies who are fighting their need to sleep. Next time: A Preview of Upcoming New Series! In our last post, we shared some tips that we hope you'll never need in dealing with a child’s medical emergency. I explained that I had been through my share of medical emergencies with both of my children, including a very scary set of fever-related seizures that my son had as a toddler. 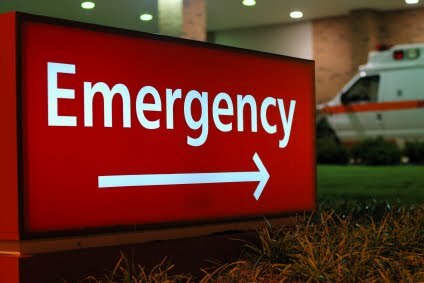 In this post, we’ll talk about what you might experience during and after the emergency room visit and share some tips to help you feel a bit more prepared. Typically, when you come into the emergency room with a baby or a young child, you won’t have to wait very long before you are seen by a doctor. However, once the initial assessment is made, you may have to wait quite awhile before the doctor has enough information to determine the best treatment plan, especially if he or she needs to wait for test results. 2. Be ready to tell your story several times. If the cause of your child’s medical emergency is not obvious, you may need to speak with several doctors, nurses, and technicians. You may find yourself repeatedly describing what you know about your child’s situation. While this may seem inefficient, getting information first hand is best. If staff members don’t seem friendly or understanding while they are asking you questions, keep in mind that they are doing everything they can to help your child as quickly as possible. 3. Make sure you have all the follow-up information and instructions with you when you leave the hospital. Before you leave the hospital, you will be given a sheet of instructions, prescriptions, and any other information that you need until you see your baby's doctor for follow-up. Put these papers in an obvious and safe place so that you are sure to 1) keep them with you and 2) know where they are when you get home. With all the stress and excitement, it is very easy to lose track of important papers that you are given in the hospital. 4. Recognize that both you and your child will need time to recover. Nearly all parents will find themselves emotionally spent after a child’s medical emergency. The adrenaline that kept you going will drain away, leaving you feeling exhausted, confused, and a little sick. If you haven’t already reached out for some help, you’ll want to do that for the first few hours (or even days) after you come home. You might find it hard to fall asleep but you should rest if you can, if only by sitting quietly. Though not all families will experience after-effects of a medical emergency, it is important to watch for any long-term changes in your child’s moods or behavior and discuss them with your child’s doctor. You also might find some changes in your own feelings and behavior and it is important that you share any lasting anxiety or concerns you might have with your own doctor. As we wrap up this short series, let me say again that I hope that none of you will ever find yourself in an emergency room with your child. If you do, remember that you’ll need to stay focused, cooperative, patient, and aware of your child’s needs as you move through the worst moments. Once you get home, recognize that there might be emotional as well as physical effects of your ordeal as you work to put the emergency behind you. Watch for signs that anyone in your family is having a hard time coping with what happened and make sure they get the help they need. Next time: Dealing with a baby who hates being drowsy. As a parent, I’ve spent my share of hours in the emergency room. Between my two children, I’ve taken about a dozen trips to the ER, two in an ambulance. Some examples: in high school, my son suffered a broken jaw and facial injuries when he was hit in the face with a baseball during practice and in elementary school, my daughter slammed a car door on her own thumb. Medical emergencies are traumatic for everyone, especially when they involve young children who are not yet able to communicate well or fully understand what is going on around them. When my son was a toddler, he suffered a series of fever-related seizures starting at 17 months and ending when he was about 3. Most children never have seizures despite high fevers; my son had 6 in 18 months. While his situation was never life-threatening, my husband and I faced some terrifying moments as my daughter, who was six at the time, looked on. My experience with my son’s seizures taught me some important lessons about coping with children’s medical emergencies. In this short series of posts, I’d like to share some important tips that I hope you never use. Since you are using the internet to read this blog, you know that there are many websites that can help you decide whether or not a situation is a medical emergency. We won’t focus on preventing or identifying emergencies; instead, we’ll discuss coping strategies if one does occur. First, we’ll offer 5 tips to help you be better prepared both before and during the first minutes of a medical emergency. Next time, we’ll talk about how to deal with the emergency room experience and the repercussions that may arise after the emergency is over. Even though you can never be fully prepared for a medical emergency, here are some important steps you can take.
. Keep essential information (emergency phone numbers, your doctors’ contact information, significant allergies, insurance information, and descriptions of any prescription medications) with you at all times. · Take a class in infant/child CPR and first aid. Even if you never use any of the skills you learn, taking the class can help you feel less helpless during an emergency. I took the class (the first time) after my son had his first seizure and it helped a great deal. Ideally, you should take the class several times, every year, if you can. · If you have an ongoing medical issue, like we did, you’ll want to keep a history of events (like medical tests, dates of prior ER visits, and current medications) with you. It is easy to forget important details in a crisis. There is no point in telling you to “stay calm” because few parents can remain calm while dealing with a child’s emergency. As you might imagine, your emotions will be overwhelming but you should try to do your best to concentrate on getting a complete picture of what is happening, listening carefully to instructions, responding clearly and concisely to questions, and taking any needed action. Your instincts will typically keep you going, though a part of you might feel confused or detached. If you start to panic, remember that your child needs you. Some tips to fight panic: try to consciously relax the muscles in your face, shoulders and neck, slow your breathing, and focus all of your attention on one thing at a time. Tell yourself that you can fall apart later. I can tell you from experience, you will. 3. Make sure that the emergency personnel can find you. Depending on your emotional state, you may need to ask someone else to call for help or remain nearby to answer questions and provide your location. When you are under extreme pressure, it is not strange to become confused even about places you know well. If you are outside, check to see if your location is easy to spot from the road. If not, look for a landmark that you can describe or a bright colored object you can use to mark your location. If you are inside of a building, send someone outside to meet the emergency personnel. 4. Follow all instructions from emergency personnel. Medical professionals are trained to collect the information they need and to assist your child very quickly. You may not understand the reasons for their questions or the actions that they take but it is important that you don’t interfere. You can be a vital resource or a massive roadblock for those who are trying to help your child. Do your best to be part of the team. 5. Consider asking someone else to care for your other children. Whenever possible, you should avoid taking your other children into the emergency room. My daughter has vivid memories of the sights and sounds in the hospital (including blood spurting on a curtain) that could have been avoided. Obviously, you don’t always have time to make an extra call during a crisis but if someone else is caring for your other children (such as friends and family who meet you at the hospital), you’ll be able to focus your attention on the child who is ill.
Next time: Arriving at the emergency room and helping your child (and yourself) deal with the emotions after a medical emergency. Our 1 year anniversary isn't until next month, but today we achieved an exciting milestone - our 100th post! We hope we've answered your Baby Behavior questions and look forward to our next 100 topics! If you are new to our blog, browse our previous posts. We've covered many of the most common Baby Behavior topics including infant sleep, crying, and developmental milestones (just to name a few). 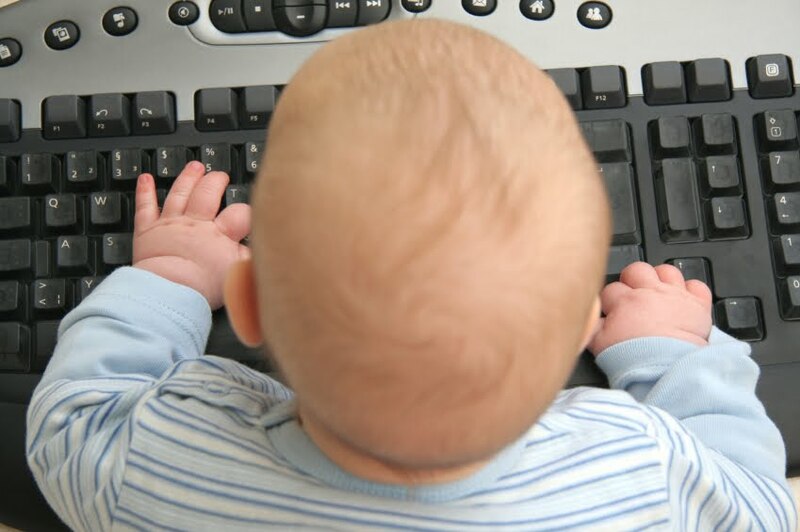 If you have questions about your baby, please send us a comment and we'll add it to our list for future posts. In part I of this series, we talked about how parents may "diagnose" infant teething as the cause of symptoms like fever, runny nose, diarrhea, skin rashes, irritability, and sleeplessness. Results from research studies have challenged parents' beliefs about teething, indicating that no symptoms are linked consistently with tooth eruption in all children. In this post, we'll look at some of the ways parents may "treat" their teething infants and how the research might help you to decide which of these methods, if any, to use with your own infant. Parents don't have to go far for advice on treatments for infant teething. Family, friends, even strangers in the grocery store will readily share their expertise. Of course, all parents will try to comfort their teething babies, but sometimes their efforts to hold or rock their babies don't seem to be enough and they want to try something else. Before you read the rest of this post, we want you to know 2 things. First and foremost, we are not medical doctors. You should talk to your health care provider about ANY medication that you wish to give your baby. Second, we are NOT recommending any of these remedies. We are only reporting what we've found in studies on teething. That said, let's take a look at the pros and cons related to the top 3 most common "treatments" for infant teething. Pros: Nearly all parents think that their babies drool and want to bite on things while teething. A well known remedy for infant teething discomfort is to offer the baby something hard (and often cold) to chew on. Babies' gums tend to swell and become sensitive as teeth emerge and it makes sense that babies should respond well to biting down on something firm and cold. Many do. Dozens of teething toys can be found in any store that sells baby goods. Health care providers sometimes recommend cold hard vegetables or clean cloths that have been put into cold water. Many babies prefer to bite daddy's or mommy's fingers. Beware! You don't want to learn (the hard way) how effectively babies can bite down with those new teeth. Cons: Parents need to be careful to avoid choking hazards or toys that can come apart. These toys also typically don't work if the baby is already very fussy or has awakened in the night. Pros: The most common medication given to babies to reduce pain and fever is acetaminophen (also called paracetamol) sold in preparations especially for infants and children. The effect may last for several hours. More than half of the parents in the studies we reviewed reported using acetaminophen occasionally to help their babies deal with the pain associated with teething. Cons: Some parents reported that their babies' "teething symptoms" lasted for up to 4 weeks before teeth emerged. While considered by most pediatricians to be a safe medication for babies, acetaminophen is not meant to be taken for a prolonged period of time. If you think your baby needs any medication more frequently or for a longer period of time than is recommended, talk to your health care provider before you do anything that is not on the instructions provided with the medication. Also, clinicians worry that parents might delay taking babies with health concerns (like ear or respiratory infections) to the doctor if the symptoms seem to improve with the use of over-the-counter medications. Pros: Just like acetaminophen, many topical gel medications, made to be put directly on babies' gums, have been around a long time and are considered to be safe by most pediatricians. They usually contain some kind of pain reliever (like lidocaine) and are formulated to stay on the babies' gums at least long enough for the pain reliever to take effect. Cons: The medications in these gels only work for a short time and are washed off by the baby's saliva fairly quickly. Also, if teething is not the reason for a baby's fussiness, the gels won't work at all. There is also the possibility that tired parents might make a mistake and use the wrong gel in the baby's mouth. Obviously, you need to be careful when using any medication, for yourself or your baby. When I was a baby (long, long, ago), some parents used brandy or a sweet alcohol preparation to sedate babies who were teething. Grandparents or great- grandparents may be suggesting that you try alcohol. Resist the temptation to use anything to sedate your baby. Bottles propped in babies' beds have also been used to keep fussy babies from bothering sleeping parents during the night. Leaving bottles of milk, juice, or formula in babies' cribs has been linked to cavities and damage to babies' teeth. Researchers believe that there are no diagnostic symptoms of teething that will show up in all babies and that most teething symptoms are short-term and fairly mild. Why then, are we so full of ideas about teething babies? The experts would say that parents who describe the "symptoms" of teething are actually describing the "symptoms" of being a baby. Now, we don't mean to say that teething is easy or fun. Teething is tough, on babies and on parents and each baby will experience teething in a different way. When selecting a "treatment" for teething, parents should first rule out other causes for their babies' behavior. For example, a baby with a fever and a runny nose probably has a cold and parents need to watch for signs of a more serious infection. A baby with runny stools might have eaten something off the floor. Pain medications may not be useful if a teething baby is fussy because he is frustrated while trying to learn a new skill rather than by pain in his mouth. Those of you who have been reading the blog know a great deal about your babies. Be sure to consider the big picture before deciding to take action to "treat" teething. Next time: We'll answer more readers' questions.